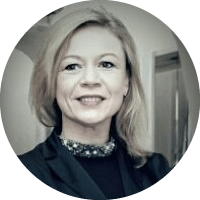 Dorota Zimnoch is an international fintech and insurtech expert and the Top50 global influencer. As a founder of Zing Business Consulting, Ms. Zimnoch advises corporate boards in the financial services and focuses on business transformations and turning digital disruption into market-winning solutions allied to effective and high-quality implementation. She gained her experience working with leading financial brands such as Citi, AIG, Alico, MetLife, and 4finance, as well as startups. Ms. Zimnoch is also a Strategic Adviser at The Heart. She is an active member of the tech communities in London via Tech London Advocates, FemTech Leaders, and InsTech London. Ms. Zimnoch is a guest speaker at globally focused conferences. HOW DID YOU GET TO BECOME AN EXPERT IN INSURTECH? In the last 20 years (well before term InsurTech was introduced) I spent majority of my career building and executing digital strategies, driving successfully large scale complex digital transformations, pioneering many innovative products and services and changing the way customers perceive, buy and use financial products. I gained my knowledge and hands-on experience working with the financial brands like Citi, AIG/Alico, MetLife, 4Finance and in last few years leading the business consulting practice. WHAT AREAS OF INSURTECH ARE YOU MOST PASSIONATE ABOUT? I am most passionate about projects that aim to put customer at the heart of the strategy and design products, services and processes around them, applying the latest media and technologies. I am data driven and love discovering new trends and patterns and translate into innovative solutions that enhance customer experience and accelerate business results. WHICH INSURTECH INFLUENCERS INFLUENCE YOU? In a first place I gain knowledge and experience from direct dialogue with my clients and thoughts leaders. I learn from other FinTech and InsurTech experts (too many to list by name) as well as those from other industries (too many to list by name) from around the world that I am connected to in social media or meet in the conferences and events. In the connected world it is essential to see bigger picture and look holistically at customer needs and journeys. I read a lot of books in the area of economics, psychology, art, technology. I am fascinated how those disciplines converge and interconnect changing the habits, needs and preferences of customers. WHAT ARE GOING TO BE THE KEY DEVELOPMENTS IN THE INDUSTRY IN THE NEXT 12 MONTHS? From my conversations with clients I can see a lot of interest and commitment (proved by allocating resources) to driving change in the organisation. Incumbents will continue driving efficiency by automating processes across value chain using the latest technologies. We will also witness more and more partnerships between incumbents and Insurtechs. I would also expect to see incumbents launching sub-brands or new ventures (alike banks launching stand alone digital banks), with insurance offer addressed to specifically targeted groups of customers. Finally, I hope to see more solutions and new business models that truly challenge status quo and disrupt how insurance is being perceived, bought and used. Those changes will come from inside the industry but also from InsurTech and tech giant players e.g. GAFA. Financial services are moving towards offering open platforms and building ecosystems of integrated services for customers. Insurance will be important player in that field. When it comes to the particular technologies (like AI, IoT or blockchain) we will see those moving beyond POC and being implemented on the larger scale. IF A BRAND WANTED TO WORK WITH YOU, WHAT ACTIVITIES WOULD YOU BE MOST INTERESTED IN COLLABORATING ON? There is a full suit of activities I offer to brands, from running webinars or innovation workshops on site to developing and executing customer-centric strategies, designing insights driven innovative value propositions, delivering complex digital transformations. The best way to start is the discovery call or meeting in which we can clearly define the client’s objectives and then address those with the most applicable programs and tactics. I can be reached at dorota@zingbc.co.uk . I also encourage you to follow me on Twitter and LinkedIn.